Added: Without modifying the executable itself. By modifying the executable I can remove the trustInfo entry from the manifest (or the manifest entirely, so I can use an external one), allowing the program to start without UAC. Unfortunately this modifies the executable, so it exits shortly after due to an internal checksum test. By using Process Explorer I can launch it as a Limited User. However this seems to limit it significantly more than I would like (it runs like Protected Mode IE and so can access significantly less than what my standard un-elevated user can). Afterwards, right-click the app you'd like to run without administrative privileges and select "Run without privilege elevation". In some cases - small amount 0.1% of programs may ask twice about UAC prompt. Now you can drag and drop programs to this to run them without admin. This doesn't require admin privileges as changing that registry key does. Also you won't clutter the context menu. Update: Should now work with programs that have spaces in name as well. I hope I'm not too late to the party, but I was looking for a similar question and without seeing an answer here I found out that Windows' builtin RunAscommand, when run as administrator, can do that with /trustlevel switch. This worked in my case. Ironically, starting a program explicitly without elevation requires an elevated command prompt. Go figure. :) I hope it helps you. Unlike this answer, this solution requires no alternate click or change to user interaction. Microsoft calls this process adding the RunAsInvoker "Compatibility Shim". I solved this problem today using the MS application customization toolkit. I followed the instructions in a tech republic article. 1) you get the toolkit from MS here . Turns out the software I was using did not really require administrator rights so I was able to run it on a Standard User account without UAC or administrator passwords. Thanks! 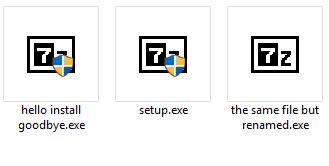 I fixed this problem by going changing the permissions on the folder that contained the program. I added each user that will run that program and gave them "full control" priviledges. That took care of the problem and I left the "run as admin" unchecked. I don't have any security concerns for the users who will be running the program. No, if a program requires UAC then it is trying to access something outside of its sandbox. The program will not correctly run without the elevated access. If you just want to get rid of the notification, you can disable UAC. Disable UAC on Windows Vista: Start, type "user". Click on "User Accounts". On the window that pops up, click on "User Account Control Settings" and then Turn off UAC. Disable UAC on Windows 7: Start, type "user". Click on "User Account Control Settings". Drag the choice bar all the way to the bottom to "Never Notify." Not the answer you're looking for? Browse other questions tagged windows administrator uac or ask your own question. How to force any program to run with no admin privileges in Windows 7? Running a program as non-admin from an admin script? Windows 8 Task Manager without elevating? How to disable “Installer Detection” feature of UAC in Windows 7 Home Premium? How do I configure my application to run as administrator automatically? How to run a program with elevated permissions from a limited permission user account without administrator password?